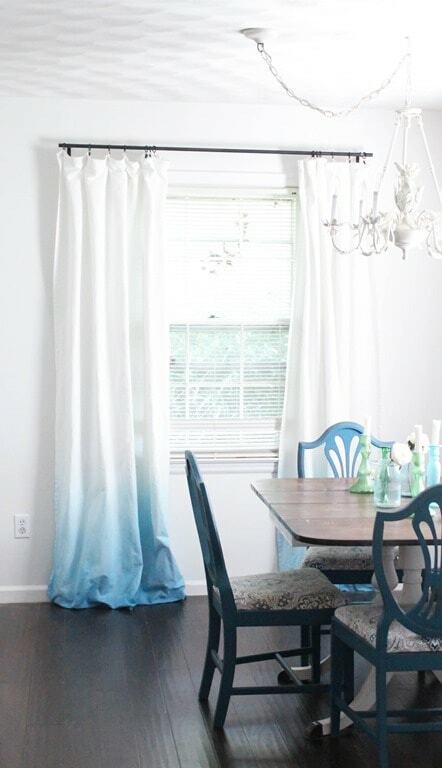 DIY Blue Ombre Curtains - Lovely Etc. Our dining room has been this close to being complete for awhile now. The only problem: the white wall and white curtain combo was seriously lacking in color. 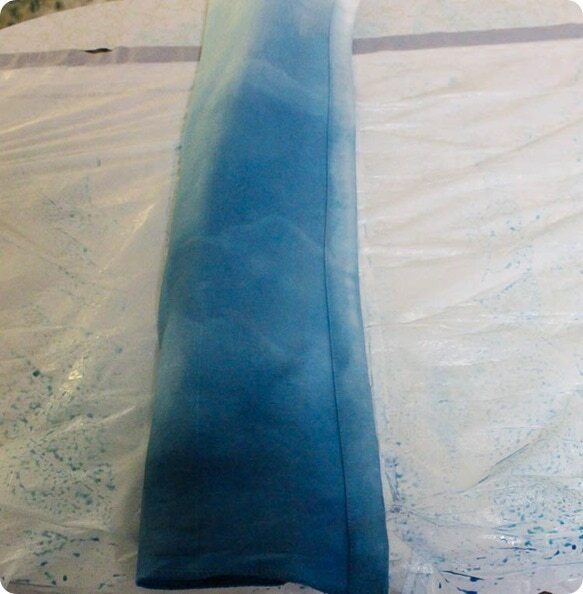 It seemed like the perfect opportunity to try a project I’ve been wanting to do for months: DIY blue ombre curtains. And even better, I’ve joined up with five other creative geniuses for this month’s Create and Share Challenge. 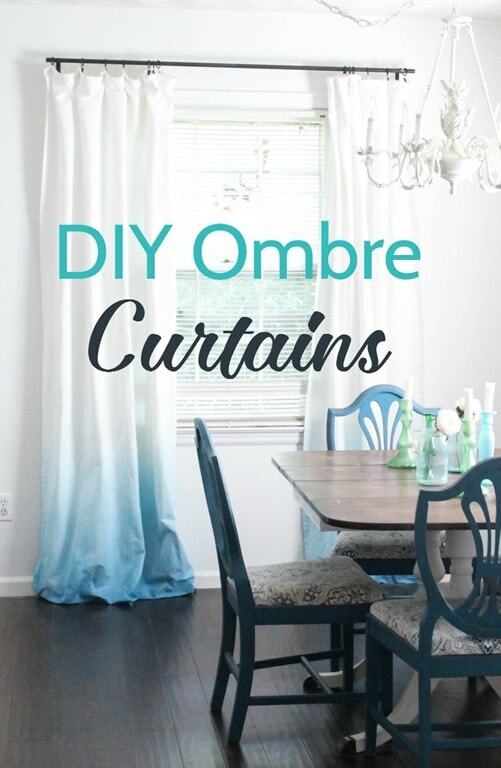 We each created something fun using a pair of simple white curtains, so if ombre isn’t for you, keep reading for more beautiful ideas at the end of this post. This post contains affiliate links. Thanks for supporting Lovely Etc. See my full disclosure here. 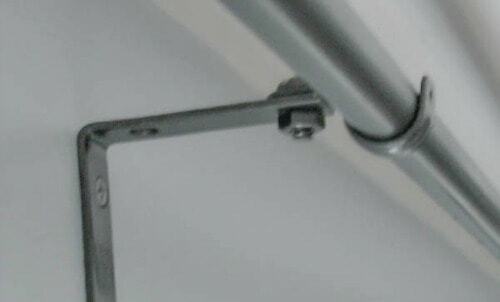 Once your work area is well-protected, spread out the bottom of your curtain panel. Make sure that you have a cup of water and your paintbrush nearby. I wasn’t able to take many pictures of the actual process because you need to work quickly, so I will do my best to explain my process. Funny story, when I asked my husband what he thought about them, he said, “They’re nice. Are you going to finish dyeing the top part?” Haha, um no, that’s the whole point. 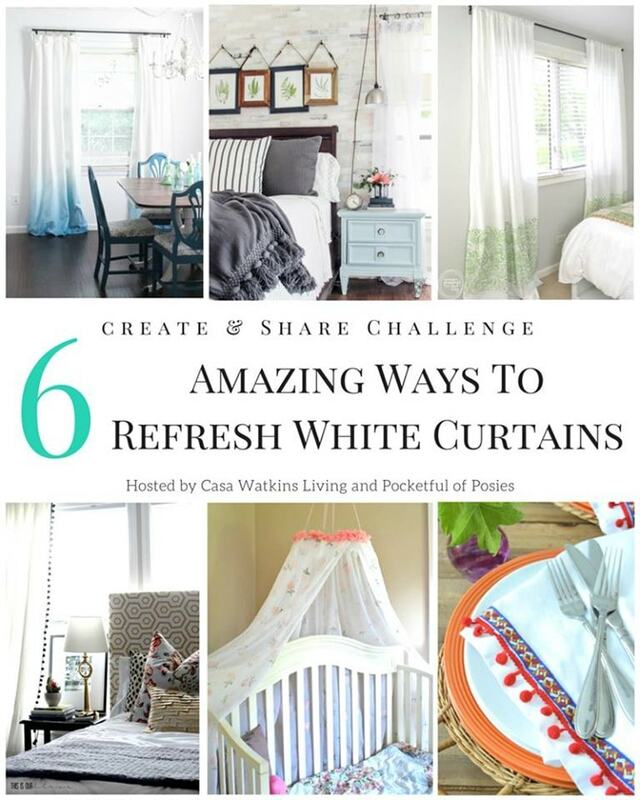 Ready to see more fantastic ideas to update white curtains? You have got to check out these projects from my friends. I am seriously impressed with these styish projects. DIY Blue Ombre Curtains – Lovely Etc. These are amazing!! Love the ombre effect and it works fantastically with your dining room as well as the living room. 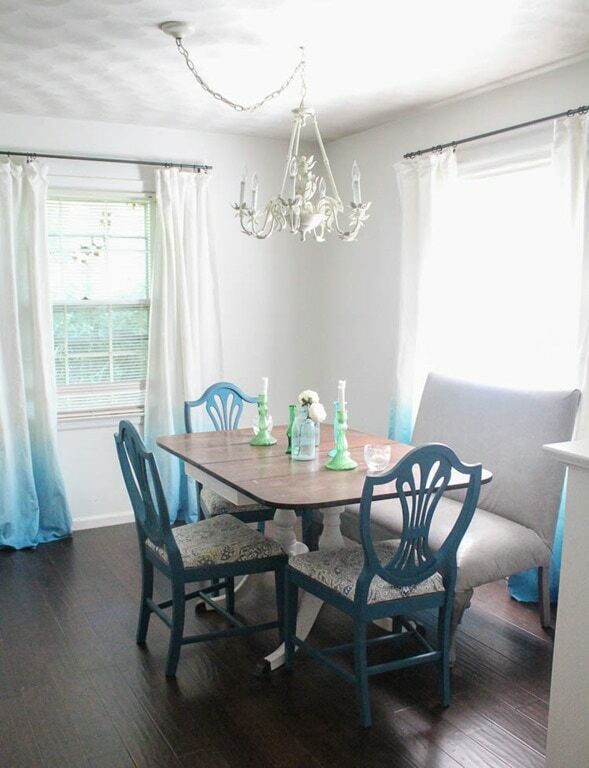 It totally brings the blue from the living room into the dining room. Thanks Stephanie! I am loving them! 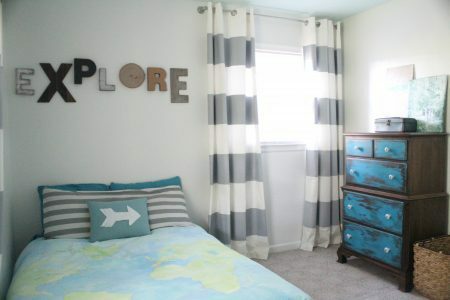 I love how your blue curtains turned out, and I love how you created the ombre effect. Honestly, I’ve tried to use the “slowly pull it out of the bucket” method, and I don’t like the way it turned out as much as yours with the paintbrush. Thanks for the tip! Thanks Jenny! I really love how they turned out! Hello Carrie, I absolutely love the Ombre look! Any idea how I’d go about making it go farther up the curtain? Thanks! 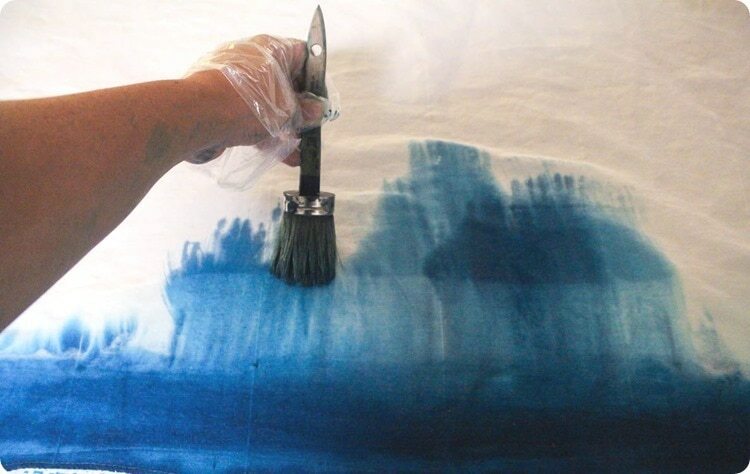 To make it go further up, I would start by squirting the dye in several rows along the bottom before brushing it up. Then you can just brush it up as far as it will go. 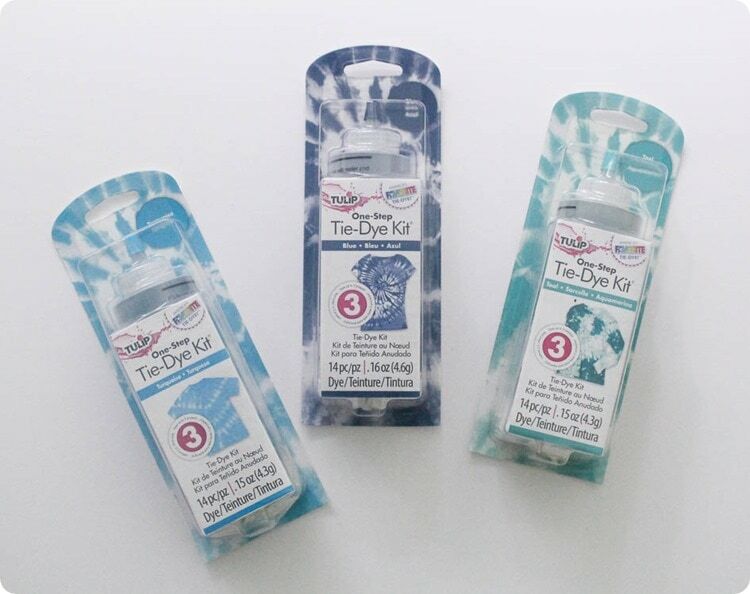 You can always add more dye as needed! Thank you soo much! I found this post soo helpful. 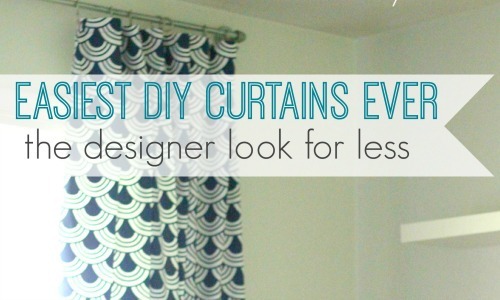 I find myself in the same predicament to upcycle my existing drapes rather than get new ones. And figured it will be a lot more fun to do it this way! 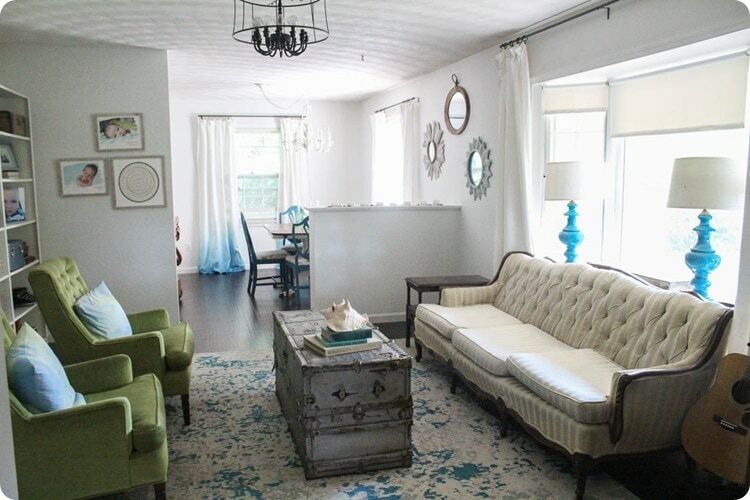 I want to do a black ombre on the already off – white drapes. Was really just gonna dip and slowly pull out untill I saw ur post. Thanks for the tips. Wish me luck! Good luck! I hope you love the results!